Just how far would you go to protect your family? That's a tough question that Nigerian nurse Korede has had plenty of chances to ponder, thanks to her vain and entitled little sister Ayoola. The pragmatic and hard-working Korede is one of those older siblings who is regularly having to clean up the messes their younger counterparts make of their lives. Though in this case the messes aren't social, emotional or financial, but the kind that require rubber gloves, bleach, and a working knowledge of blood removal and body disposal. For Ayoola seems chronically unlucky in love, sashaying her way through the world only to find herself 'forced' to kill yet-another boyfriend. Always in self-defence, of course. Not that anyone is alive to contradict her. Korede had witnessed the violence on one occasion, but has begun to doubt whether Ayoola has really been dating a string of abusers, or has become something far darker herself. Can the family bonds and belief survive when Ayoola starts dating a doctor that Korede has long had a crush on? 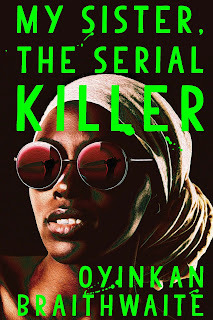 Debut crime writes Oyinkan Braithwaite certainly stamps a mark with her first effort, a deliciously deadpan tale that's as bold and in-your-face as its title. There's a fierce energy to this slim novel, a crackle and fizz through the prose as Braithwaite weaves a dark tapestry from threads of noir, black comedy, and family drama. MY SISTER THE SERIAL KILLER is a compelling read that draws you in quickly and keeps you cemented to your seat throughout. Braithwaite textures her debut with the Nigerian setting and the everyday lives of her characters, showing plenty of talent and promise. A novel to enjoy from a writer to watch.